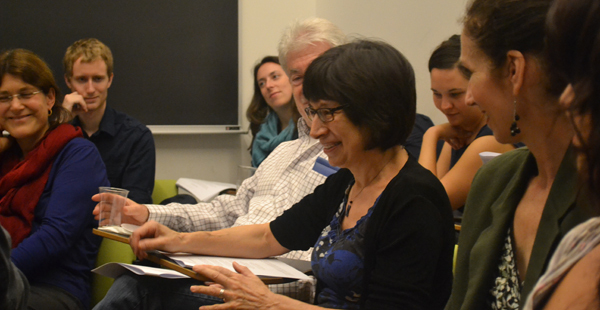 Columbia University’s Oral History Master of Arts Program is the first program of its kind in the United States: a one-year interdisciplinary MA degree training students in oral history method and theory. Through the creation, archiving and analysis of individual, community and institutional histories, we amplify the critical first-person narratives that constitute memory for generations to come. Our innovative curriculum combines professional and academic education. Academics learn to communicate with the public and produce knowledge of broad relevance; other professionals benefit from research experience and grounding in the history of our field. Our graduates work in museums, historical societies, advocacy organizations, media, the arts, education, human rights and development. As independent contractors, they manage oral history projects, teach interview workshops, and offer project consultations to leading institutions and community organizations. They earn doctorates in fields like anthropology, sociology, history, journalism, and American studies or professional degrees in law, education, or social work. During a year at OHMA, students hone skills in digital audio and video production and editing, digital archiving, oral history project design and interviewing, and both historical and social science analysis. Working with an OHMA faculty member and an outside advisor, each student is guided through the process of creating a thesis or capstone project. Many of our students work at the intersections of the arts, humanities, and social sciences, and past projects have taken the form of academic and creative essays, film and audio documentaries, performances, exhibits, and multimedia websites. OHMA students also have access to research and travel funding, elective courses taught anywhere within the University and exclusive oral history internship opportunities. Jointly run by the Columbia Center for Oral History Research, one of the preeminent oral history centers in the world, and INCITE, a lively hub for transdisciplinary research in the humanities and social sciences, OHMA connects students with both the intellectual resources of a major research university, and the intimate society of a small cohort of talented students. Columbia’s oral history program, founded in 1948, is widely acknowledged as the original home of academic oral history in the United States. Created in 2008, OHMA brings that deep history of thought and research to bear in a world where storytelling has become a buzzword and every brand has a narrative. At the cutting edge of the field, our faculty works across disciplines in training students to conduct ethical, rigorous, nuanced, historically situated research. We support them in experimenting and finding new ways to use the methods and theoretical perspectives of oral history into the twenty-first century. Check out our Calendar for information on public programming and admissions open houses. Subscribe to our newsletter to keep up-to-date with OHMA news and announcements. Contact our faculty and staff to discuss oral history projects, coursework, consulting, and careers paths. Visit our student projects website to learn more about the work being conducted in OHMA. Download our brochure and one-pager to review a summary of the program. OHMA is proudly an institutional affiliate of the Oral History Association, North Eastern Humanities Consortium, and Groundswell: Oral History for Social Change.